Written by dewpoint on April 8, 2015 . Posted in On Point Blogs. Security is a top concern for many enterprises. Your data (and your customers’ data) is very valuable and you need to protect it. Even small business owners are recognizing the importance of protecting their data. Last year eMarketer reported that nearly 40% of small business owners are augmenting their data protection technology. While both small businesses and large enterprises take measures to build their security, cybercriminals are also developing more sophisticated ways to steal your data. Unfortunately, the more big data a company has, the more of a desirable target it becomes. Let’s examine some top Data Security Challenges and look at a few measures on how to meet these challenges. With emerging technology such as cloud computing, it’s vital for a company to address protection concerns. However, if an enterprise just throws a generic technology at the problem then walks away, disastrous results will mostly likely ensue. Protecting data is a 24/7 concern. Even if you have a dedicated and talented IT staff, it’s not enough to assure that your data is safe. Cybercrimals work around the clock and are constantly developing new nefarious ways to breech your security walls and steal your data, which could also comprise of sensitive costumer data. Protection involves people who can tailor a specific plan for enterprise’s needs. If you haven’t already, consider teaming up with a knowledgeable security partner who can address your challenges. In big data environments, do the distributed environments create more vulnerability to attack? What about multiple platforms such as desktop and mobile? Is there standardization among all the data environments? Large enterprises are also prone to collecting massive amounts of data. While they deal with the obvious concern of storing and backing up the data, some companies forget to continually maintain the integrity of the data. And how to protect it. A technology partner who specializes in data protection can help implement strategic measures to analyze, monitor and maintain your data security. Criminals are constantly targeting your data so it’s important to be proactive in your protection. As we mentioned above, protecting data is a 24/7 concern and while you may the best intentions of doing so, you may lack the resources. Data security not only involves a customized strategy, but the team to execute the plan. Don’t be caught scrambling when the inevitable data disaster happens. What happens when data is compromised by hackers? How will you react to the outside attacks? Do you have proper plan and people to get your security back up? 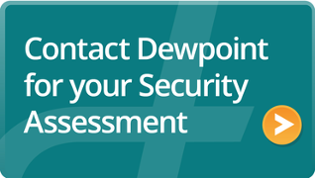 As a leader in strategic solutions, a Dewpoint can help review your current data security and map out the best path for a more secure, strategic data protection and archive solution. Is your organization’s critical data protected from disaster? Are your back-up procedures current and streamlined to most efficiently use precious datacenter space and energy resources? “Dewpoint understands business and regulatory requirements for data security and can leverage technology partnerships in order to deliver a secure enterprise for the customer,” adds DuPree. Overall, proactive data security planning now can save your enterprise some future headaches and help your organization to continually grow. Learn more about Dewpoint’s Protection and Archive Solutions.